In her 88 years, Antonia Alves has seen much hardship as a member of Brazil's indigenous community, whose people have often been driven from their ancestral lands over conflicts with farmers and loggers. Until a few days ago, she had never seen an entire river die right before her eyes. This is the unthinkable ecological nightmare her people are facing, however, after a dam storing mining waste collapsed in Minas Gerais state in southeast Brazil, engulfing the village of Brumadinho, where 110 people have been confirmed dead. Another 238 unfortunates are still missing, hopes of their recovery all but gone in the toxic wave of sludge that engulfed them, suffocating everything in its path to the Paraopeba river. 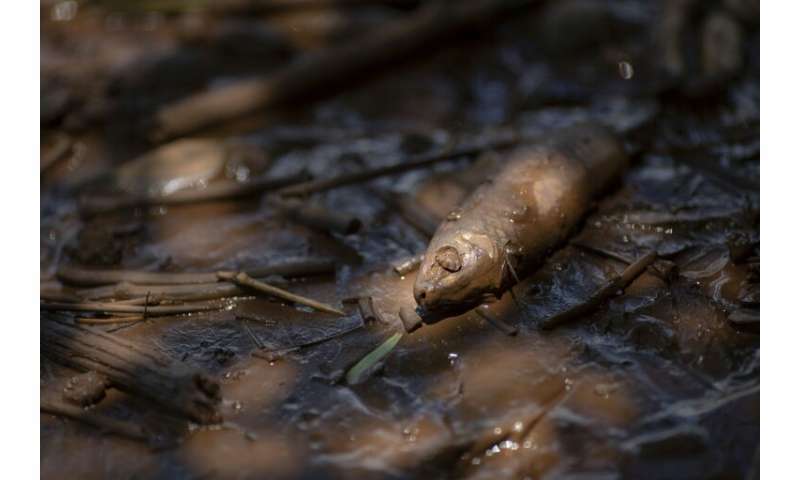 The brown waters, which reek of dead fish, reached as far as Nao Xoha, a village sheltered by the Atlantic rainforest 14 miles (22 kilometers) from the burst dam. Alves and her small branch of the Pataxo Ha-Ha-Hae indigenous people settled in the forest a year and a half ago, relocating from their strife-torn ancestral lands in the north to live in nature according to their customs. 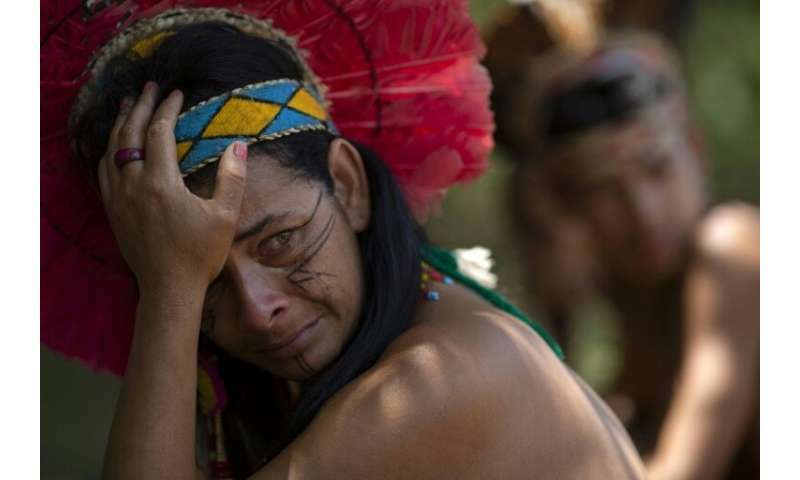 "It is very sad because we lived off the river," said Alves, her face lined by age and sun, head crowned with a band of white and purple feathers. "We bathed there, took our water from it, washed our clothes there and fished from it. Indians live from fishing and hunting." Alves' neighbor Jocelia Josi describes the stench as she pulled dead fish from what formerly an important tributary of the Sao Francisco, the longest entirely-Brazilian river. "Now we don't have any more food from there," said the 46-year-old, who is waiting for her daughter and three-month-old grandson to return from the state capital Belo Horizonte, where they were evacuated after the disaster. It is lunchtime in Nao Xoha—which means "warrior spirit" in the community's native tongue—and Alves and her husband Gervasio, a serene elder of 93, are waiting for their daughter to finish cooking outside their modest hut. But today is no normal day. Nothing has been normal here since Dam Number 1, owned by mining giant Vale, burst last Friday, dramatically changing the lives of the 27 families living in the village. Nao Xoha lacks its own medic, but a doctor has checked up on the 15 people who were not evacuated, and volunteers have brought supplies to the community, which always lacked electricity and now has no water. To reach the village, visitors have to cross a railway line where cargo trains pass and then enter the verdant Atlantic rainforest. The dam breach unleashed a torrent of almost 13 million cubic tons of mud that swept across the countryside before reaching the river. But its impact spreads even further than the vast scar of mud that rescue services are probing for the bodies of the missing. 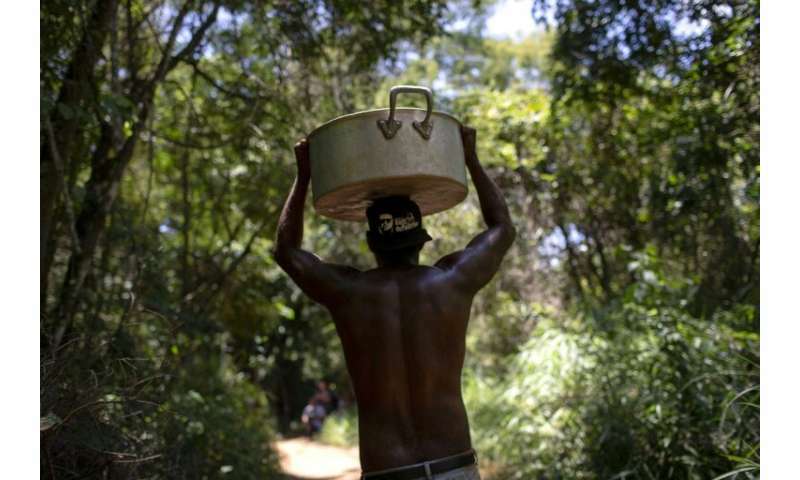 The government of Minas Gerais has warned that the metal-tainted waters present a health risk and organizations like the WWF have said the environmental impact will be felt for years to come. "They have taken away part of our reserve, killed a part of it, but we are a village of resistance and we will get over this," said community leader Hayo Pataxo Ha-ha-hae, who sported a head dress made of palm fronds. "We will carry on even if the river has died. Nature depends on us to preserve it." 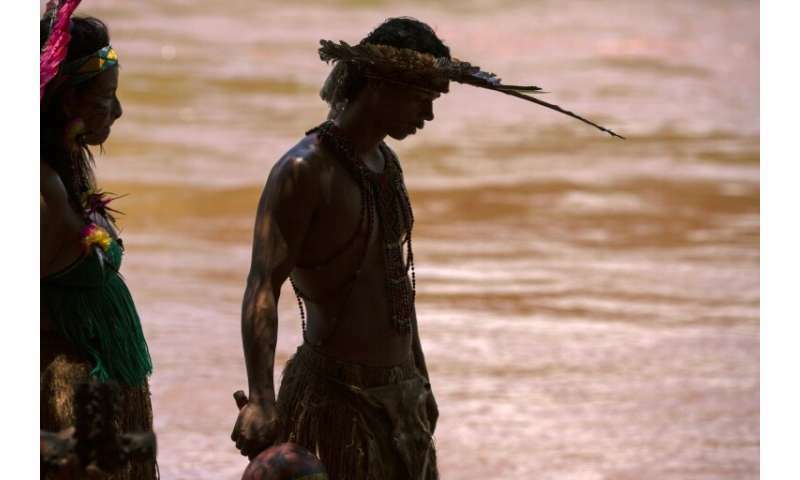 He had just attended another meeting with FUNAI—the Brazilian government body responsible for indigenous peoples' interests—and said it was too early to determine what action the community would take against Vale. He simply insisted that his people would resist, and defend their traditional lifestyle, just as they have for centuries. "It shows a lack of respect towards us", said Tahh'a, a well-built watchman aged 55, his frown wrinkling the black paint on his face. "The biggest loss for us is the fish, because we are not permitted to hunt around here," he said, holding a pointed stick in his hand, a machete dangling from his hip. While the full extent of the environmental impact remains unclear, the precedents are not encouraging. No one here can forget the destruction of the Rio Doce river, also in Minas Gerais, which was devastated by the collapse in 2015 of the Mariana dam, the biggest environmental disaster in Brazilian history. That barrier was also jointly owned by Vale. "I want to tell not only Vale, but also our leaders, to punish those guilty of doing this to our indigenous nation, together with the farmers and the families who lost people," said 29-year Hayo. "How many more people have to be killed before the justice department takes notice?" he demanded. "It is very sad," added Alves. "When are they going to clean up the river? When will there be fish in it again?"